Butterfly Conservation will receive 10p per bottle sold. 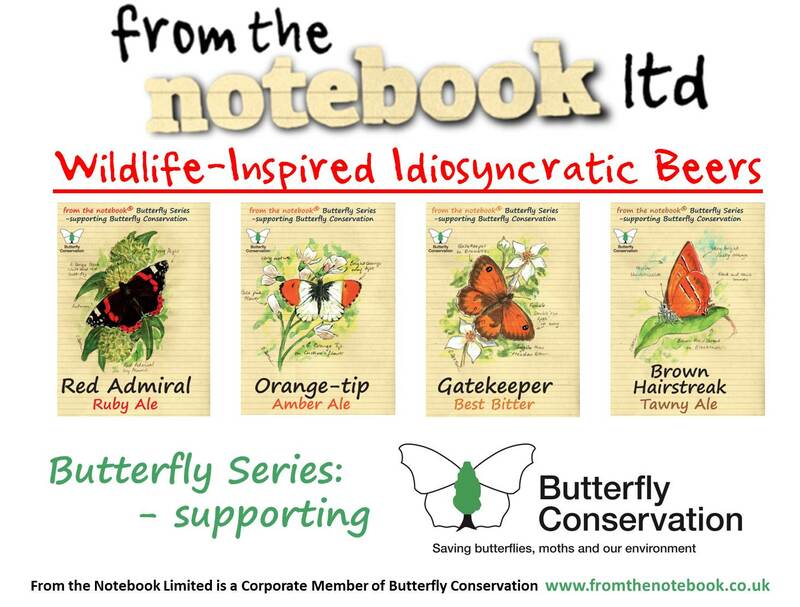 From the Notebook Limited are now Purple Emperor level Corporate Supporters of Butterfly Conservation. In line with the production of the new Butterfly Beer stocks we had a Press Release, detailing the new range. The Press Release was orchestrated admirably by Kevin Palmer Media Services and led to exposure in the Nottingham Evening Post, Derby Telegraph, Newcastle Chronicle, a live radio interview on BBC Radio Derby, an article in Derbyshire Life and Countryside Magazine and web-based exposure at the websites of the British Guild of Beer Writers, Beer Today, Midlands Business News and the Erewash Partnership website (of which FTN Ltd is a member). This excellent exposure has led to new business, with Leigh Norwood, a member of the Beer Writers Guild being interested in the concept of our beers supporting Wildlife Conservation. 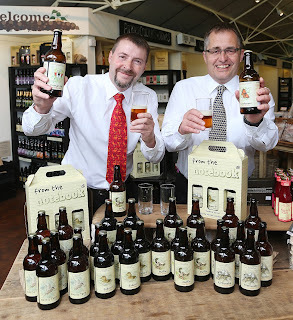 As a result, FTN beers are now stocked at Leigh's fabulous shop, Favourite Beers in Cheltenham. Also we are now selling at all 3 Brown and Green delicatessens around the country, namely Derby, Trentham (Staffordshire) and Newent (Gloucestershire). We are pleased to add Boda Home in Whitley Bay to our growing list of stockists and our beers are currently selling well there. Long may it continue. 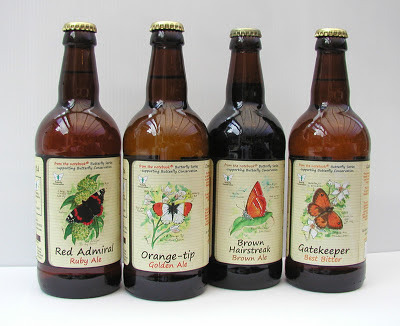 Further additions to our range of beers in support of Butterfly Conservation are planned for 2013-2014, so please re-visit our Twitter feed (@FTNLtd) or this blog from time to time to see what's brewing! 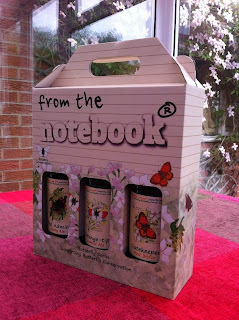 In the meantime, our new Butterfly Beers Gift Pack are also available with Tasting Notes for the new series. Try them - they're flutteringly good! From the Notebook Ltd is pleased to announce the imminent arrival of our second series of beers. Working in conjunction with Butterfly Conservation, we have developed a range of Butterfly-inspired beers. 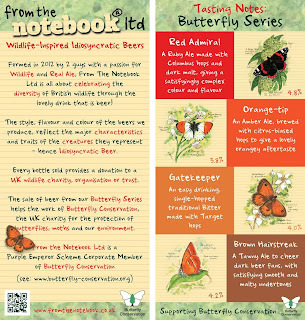 The first 3 beers of the Butterfly Series are due to be released on 29th June 2013. The initial range will consist of Red Admiral, Orange-tip and Gatekeeper, with Brown Hairstreak to be brewed and launched later on in 2013. Sales of the Butterfly Series beers will attract a donation from FTN Ltd to Butterfly Conservation to assist their work in protecting butterflies, moths and our environment. These payments will, in turn, support FTN's Corporate Membership of Butterfly Conservation. Allendale Brewery did a remarkable job for FTN in producing the Seabird Series, so it was with supreme confidence that we once again engaged Allendale in assisting us to develop this new range. And once again, these exceptionally talented people have produce quality beers in a range that shows off their diverse brewing skills. Having tasted the test brews, we are confident that the upcoming commercially brewed batches will be just as good and popular as our Seabird Series is currently proving to be. We cannot wait to get our hands on the finished product at the end of June 2013. These beers will initially be on sale at our usual outlets, with online sales being managed by Northumbrian Gifts. They will be available to pre-order through Northumbrian Gifts until their official release and general sale thereafter.